Oral dissovable thin films, such as pharmaceuticals, can be packaged in vapor barrier foil lamiantes with this multi-lane horizontal form fill seal machine. It is availa le as: single lane, 2 lane and 4 lane machine. It can package up to 180 small pouches of thin film strips per minute. Ideal for small flat items such as packaging of oral thin films and oral dissolvable films for pharmaceutical, diagnostic tests, or CBD based products. 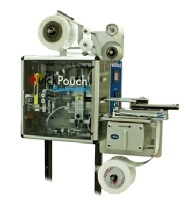 Either peelable foil laminate pouch, or standard four-sided seal foil pouches can be produced by this machine. The form fill seal machine will automatically load small flat products like thin film and flat dianostic devices into four-sided seal pouches,. Custom loading options can cut reels of thin film products and and will load automatically into the form fill seal machine. Vison system will insure correct thin film product placement in the package so that the strips are not placed in the seal areas. Printing on the foil packaging material and on the product can be provided. Clean room compatable for medical and diagnostic devices industry requirements. The form fill seal machine has easy access safety guards. Validatable heat seal. We can also provide peelable foil lamination rollstock marerial for this machine. Single lane horizontal form fill seal machine for packaging oral thin films. Desiged for lower volume production for packaging of dissolvable oral thin film strips. Can be manually loaded. Can be integrated with die cutting system for cutting thin films prior to packaging.